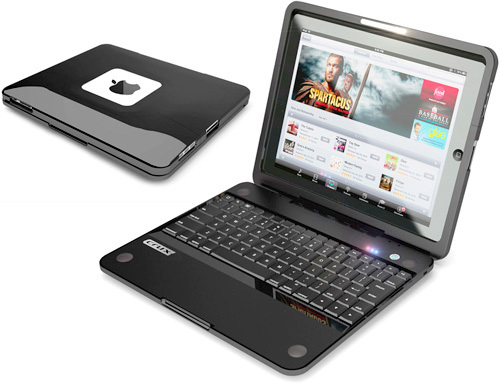 Crux360 iPad Clamshell Keyboard Case | OhGizmo! When the iPad honeymoon is over, and you realize that it’s great the 3% of the time when you just want to surf or read, but nearly useless the other 97% of the time when you want to do something productive, you can either throw it up on Craigslist and replace it with the laptop you probably should have bought in the first place, or find some way to fix its shortcomings. If you decide to go the latter route, for just another $149 you can turn the iPad into a pseudo-notebook with this Crux360 clamshell case which includes a Bluetooth connected keyboard. The case can also be contorted around allowing you to still use your iPad as an even heavier tablet, or propped up on its own for watching movies. And when completely closed the case protects your iPad’s display from accidental wear and tear while traveling. It’s not slated to ship until next month, but you’re welcome to pre-order one now if you’re so inclined. Never understood the knock on Apple products. I use my iPad 90% of the time and it's almost replaced my iMac for daily tasks. Not to mention photos and maintaining my eBay and Craigslist listings. This thing is amazing and still selling strong. The iPad isn't meant to be a computer, it is a media device. If you were stupid enough to buy an iPad when you really needed a laptop, that is your own fault. Don't try to blame Apple for your own mistake. Also, while I understand the concept behind these keyboard cases, I honestly can't think of anything I would actually need one for. If I'm going to do “productivity” I'll use a real laptop, not because it has a keyboard but because it runs things like Final Cut. The only thing this would improve is word processing, which is more like 3% of iPad use, not 97%). Apps like Pages, Keynote and Numbers, which were shown at the reveal, make me think that Apple sees it as a productivity tool too. Because Apple is just as deserving to be knocked as Microsoft. I use their products as much as I do my Windows devices, and both can be just as annoying as the other. From what I've seen the average Windows user realizes Microsoft's products are far from perfect though, not really the case with the average Apple user. I throw my hands up in frustration with my Windows PCs as much as I do with my Macs. The truth is that some people (insecure people?) will always like to hate on whatever's the mainstream and root for the underdog. And apple is now in the mainstream. The truth is that some people will always like to hate on whatever's the mainstream and root for the underdog. And apple is now in the mainstream.